A couple of years ago I saw pictures of a climbing Nasturtium in some garden magazines and was eager to grow this annual. 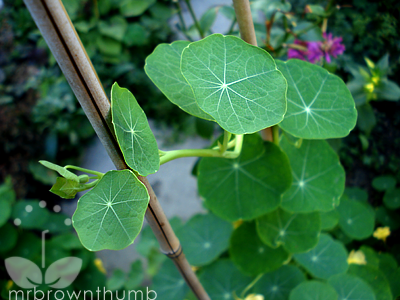 Unfortunately, I'd never come across climbing nasturtium seeds for sale in the garden centers and nurseries I visit. One garden center was particularly brutal to visit. The seed rack display had pictures of climbing nasturtiums in a rustic garden, but no actual climbing nasturtium seeds for sale. This past spring when I acquired climbing nasturtium seeds from Renee's Garden seed company and was excited to grow them. The seeds were planted in April and quickly germinated and grew to the familiar mound that make Nasturtiums such a popular border and container plant. These mounds flowered prolifically in late April, May, June and July. No surprise really, Nasturtiums are garden workhorses that way. The flowers and foliage were almost enough to make me forget that they weren't doing any actual "climbing." When I met Renee at the Independent Garden Center Show I mentioned to her that the climbing Nasturtiums appeared to be just an average mounding variety. At first she thought I meant they weren't vining and she mentioned how you have to pick up the runners and train them up a vertical surface. I told her I was aware of that, but that mine were just not doing much of anything besides flowering. She asked me if I still had the seed packet and I chuckled to myself and wondered, "Do people throw away seed packets?" We agreed that I would provide her with the lot number on the packets of seeds and she would look into it, "Perhaps it's a bad batch," she said. Maybe it was. That evening I arrived home with the intention of looking for the Nasturtium seed packets, but first I stopped by and checked on the Nasturtiums. The first thing I noticed was that overnight the darned plants had put out a couple of the long runners I'd been waiting for all spring and summer. D'oh! Now that the days are getting shorter and cooler the climbing Nasturtiums are taking off and growing like mad. The good thing about all that early flowering is that my Nasturtiums are now covered in developing seed pods. I've already harvested and dried a few seeds for next year. Nasturtiums produce no tendrils so, they can't vine up a garden stake on their own, you have to pick up the runners and give them some help. 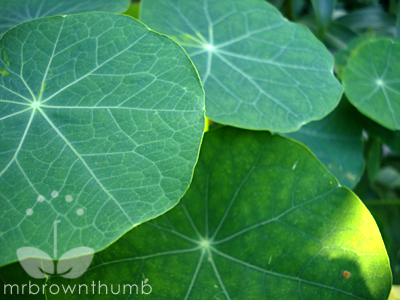 Some nasturtium varieties produce blue-green leaves, this one produces green leaves. Maybe it is just my imagination, but it seems like these leaves at the base are larger than normal. The color of climbing Nasturtium "Moonlight" in the on-line seed catalog is described as "soft primrose yellow." Renee's Garden also carries "Spitfire," a red-orange climbing Nasturtium that I didn't grow but will add to my list of seeds to get. In the years I've grown Nasturtiums as a border plant in the garden I've learned that the tips of the plant usually get stepped on. I figured that placing them up higher than ground level would keep them safe. I made garden pots out of cinder blocks at the entrance of my ghetto garden path. In these I inserted bamboo stakes that I would attach the vines too. Next year I'll make the pot out of two cinder blocks- one stacked on top of the other. The trailing foliage will be enough to mask them and when the runners appear they won't get trampled on. While I grew this climbing Nasturtium for vertical interest in the garden I think they would be just as at home planted in a window box or trailing over a balcony or deck. I can imagine how impressive the 6-8 foot long runners would look spilling out of a balcony garden and swaying in the wind. When I collect Nasturtium Seeds-My post with pictures and video to help you identify the seeds and when to collect them. 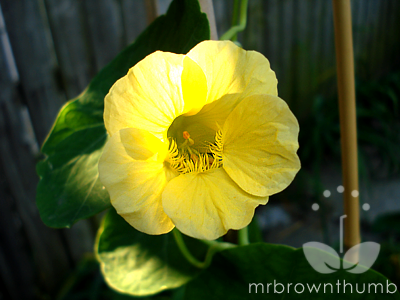 5 Reasons I Grow Nasturtium in My Garden-Post on the benefits of growing Nasturtium. Nasturtium "Jewel Mix" & "Dwarf Cherry Rose"- Two Nasturtiums varieties I've grown and written about before. 'Spitfire' Nasturtium, a red climbing variety of nasturtium. Update: Made a quick garden video so you can see this climbing Nasturtium in my garden. 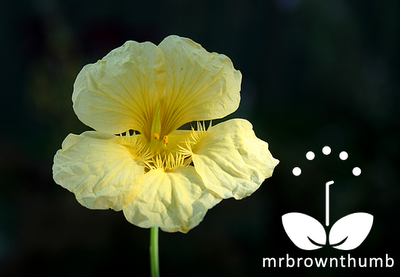 See the post on collecting Nasturtium seeds for a video on how to collect seeds from Nasturtiums in your garden. What a great story, Mr. BT! LOL. They look so healthy and pretty! I love your tip about using the cinderblocks!!! Thanks for the tip. I always wondered why mine didn't climb too. Ha! Hello! I love Nasturtium. I could only see them at the highlands here. Tq for describing how the plant could climb. 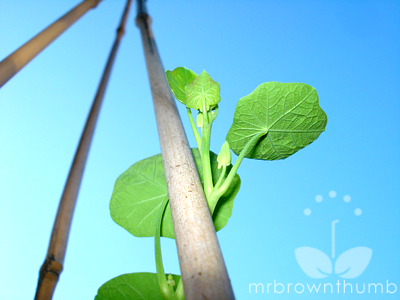 I am currently helping my sweet potato vine to climb onto a tomato cage as I am gardening in limited space here. I am hoping that it will do fine. Happy gardening! Oooh... now I'm kicking myself. I probably gave up on my own packet of 'Moonlight' a little too soon last year, when I didn't see any vining, either. :( Oh well, at least I know, right? I just bought a house early this summer and I am trying to learn as much as I can about gardening. Your blog is great - it's so informative and it speaks in real terms that I can understand! Beautiful, MBT. I love nasturiums and I also love to eat them in my salad because the leaves have a nice peppery taste. You crack me up MBT! I love the color of your nasturtiums, and your creative pottery. My mom used cinder blocks to border the new raised beds in her veggie garden. She was planning to use the holes in the cinder blocks to plant some herbs. Hmmm. . . I wonder if she ended up doing that. I grew spitfire this year. They pretty much took over *everything*, so be careful. I really liked your tire planter, so you know I'm a big fan of using reclaimed items in the garden. Thanks for stopping by. I think the trick is to complain about them to the owner of the seed company so that they then grow and make you feel like an idiot. I'm sure your sweet potato vine will do fine. Thanks for stopping by. Long time no see around here stranger. Yeah, now you know for next time. Thanks for the feedback, I really appreciate it, and thanks for commenting. Alway nice to see some new names in the comments. You can find a couple of different colors if you look around. Then there is always the possibility of taking a few seeds if you come across some planted and you ask the gardener. Some of the varities are too expensive to buy retail. Yeah! I love to eat them too but these were too "special" to eat this year. Now that I know what they'll do next year I'll feel ok munching on a few leaves when I grow them next. I thought about breaking into a demolition site the other day to get some more cinder blocks for a raised bed. I didn't do it because the police kept watching me. I wish mine would take over everything--in particular the fence that is falling apart. You should add them back to your list of plants. They are so inexpensive that there's no reason not to grow some. Those leaves could not be any prettier, could they? Would be worth growing just for the foliage.Nasturtiums are my absolute favorite, so I am just giddy to learn there is a climbing variety! Thank you so much! It's funny, while you were going for the climbing nasturtium, I was seeking out the trailing variety ;-) Happy gardening! Thanks for stopping by and I'm glad you've learned about the climbing variety. Isn't that the way things always are? You should add them to your balcony garden next year. I think I remember saying I was going to order some of these back when you first blogged about them, and I forgot. I'm definitely getting some for next year. I grew "Princess of India" and a cream colored one that I can't remember the name of. You just reminded me to go out and look on the ground for some seeds--I never catch them when they're still on the plant. Wish I had arranged a tweet-up with you during my all too brief visit to Chicago. Family and a lot of running around. @ Colleen, I tried Princess of India one year and I got something different. Haven't tried that one again because of that first experience, but I saw it growing again this year and want to try ti. You should totally collect some of your seeds. I'd like to plant the seeds I collected from my community garden ASAP but they aren't mature yet. Do you think I could dry them in the dehydrator to speed up the process? Molly, You should just let them dry naturally. I can't actually tell you that using a dehydrator would be bad for the seeds, but I can't image it would help to dry them faster than they would normally do. I'm always looking for alternative planting containers, and the cinder blocks sound like a cool idea. I'm just wondering, how do you ensure adequate drainage with the cinder blocks? The cinder block is open on both ends so the water just drains out through the soil into the ground.